When I was asked to write my BAFTAs style post, I was very kindly sent a goodie bag from House of Fraser which included a host of beautiful Lancome beauty products. 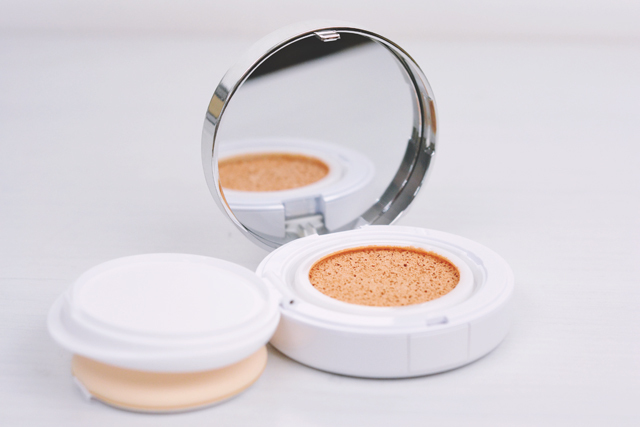 In that post, I promised I would review them all so I'm kicking off with the Miracle Cushion Foundation- a base that, rather than being dispensed from a bottle or tube, is produced from a sponge that has been saturated with foundation. Let's start with the obvious- the packaging is absolutely beautiful. A white plastic compact with a gorgeous mirrored lid (you can see what it looks like closed on my Instagram here), it's the perfect size and shape for slipping inside my bag for touch ups throughout the day. I don't tend to touch up my foundation when I'm out, but only because it's too much hassle to lug around heavy glass bottles and make up brushes with me. 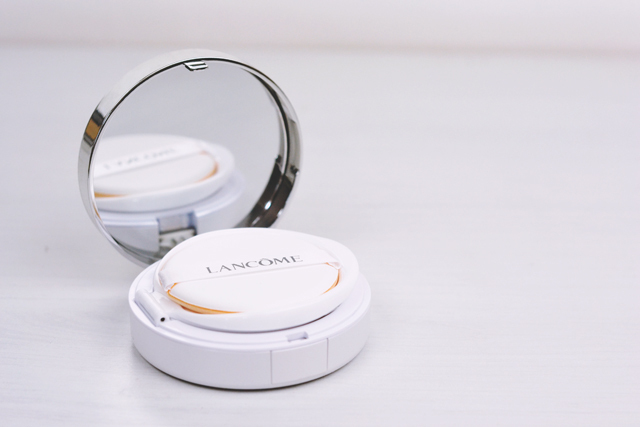 This compact takes all the fuss out, especially as it contains both an application sponge and a mirror on the inside lid. When it's opened up, the applicator sits on a little shelf that flips up to reveal the sponge. I do feel that perhaps the surface area of the foundation sponge is a bit small, especially as the applicator has a far larger circumference. This means that when I'm applying product to the applicator, I have to use the side of it, rather than being able to apply it to the whole tool, and can only put foundation on a very small part of my face at a time. Despite this, I am really happy to find out that the compact is refillable as it's so pretty. I'm not entirely sure how much foundation the sponge holds, or how many applications I will get out of it, but the box explains that I can flip the sponge around for more product once it starts to dry out. As I said, it's quite difficult to apply since the applicator is much larger than the surface area of the sponge. However, this is a small issue as, besides this, the application process is very simple. I just dab the applicator on the sponge, it picks up a small amount of product and I press it into my skin. Rather than being absorbed into the applicator, as sometimes happens with make up sponges, it sits on the surface and transfers neatly onto my skin. What I really like about this foundation is how easy it is to build up coverage. Dabbing the foundation sponge lightly creates an almost transparent look whereas a firmer touch produces more coverage. It's also really simple to apply more foundation to problem areas where necessary which results in a very natural appearance. When wearing the product, it feels light on the face and has a dewy finish without any caking or greasiness. If I'm completely honest, I thought sponge foundations were a gimmick (especially the one with that annoying dab dab, dab dab advert) but I'm very pleasantly surprised by how much I love this. For now, I'm still using NARS as my daily base as I need the heavier coverage and matte finish at the moment, but I've been reaching for Miracle Cushion when I'm in a rush or just quickly popping to the shops. It's going to be perfect for light coverage in the summer too! I love the Lancome miracle cushion, I've been using it since February and still haven't had to buy a refill yet so I think it contains way more product than it looks. I have incredibly dry skin and this is the only foundation I've tried that doesn't dry my skin out to feeling like paper by the end of the day. This looks good (you're totally right about the dab, dab, dab advert - so annoying). I'm always looking for something easy and small to put into my handbag, so I'm not carrying around a big, heavy Mac foundation!